The subjective experience of introversion and extraversion is measured by the Big Five personality dimensions, developed by Robert McRae and Paul Costa, then of the National Institutes of Health, in addition to the widely-used yet psychometrically-criticized Myers-Briggs Type Indicator. Observable behaviors associated with extraversion include positive emotions, assertiveness, sociability and talkativeness with energetic engagement in work and social contexts. In contrast, external manifestations of introversion are lower social engagement and energy, and less need for external social stimulation than extraverts, with a quieter, more deliberate style. These behaviors are at least partially based on individuals’ genetic profiles, leading to differing brain activity associated with introverted and extraverted thinking and behavior. Eysenck posited that extraverts and introverts differ in their levels of cortical arousal: Introverts, he suggested, have a higher baseline level of arousal than extraverts, so need less external stimulation. In contrast, he hypothesized that extraverts seek external stimulation because they have a lower baseline level of cortical arousal. Differences in brain structure and function among introverts and extraverts was analyzed by Yasuyuki Taki’s team at Tohoku University, including collaborators Benjamin Thyreau, Shigeo Kinomura, Kazunori Sato, Ryoi Goto, Kai Wu, Ryuta Kawashima, and Hiroshi Fukuda. The evaluated whether personality traits measured on a revised Big Five inventory (Revised NEO Personality Inventory – NEO-PI-R) were related cortical gray matter volume, measured by brain magnetic resonance images (MRI) for more than 270 healthy volunteers over 6 years. Likewise, University of Minnesota’s Colin DeYoung, Jacob Hirsh of University of Toronto, The Mind Research Institute’s Matthew Shane, and Yale’s Xenophon Papademetris, Nallakkandi Rajeevan, and Jeremy Gray used a similar method to conclude that behavioral and subjective extraversion was positively correlated with orbitofrontal cortex metabolism and increased cerebral volume of the medial orbitofrontal cortex in 116 adults. Extraversion has been correlated with sensitivity to rewards and to the brain’s dopamine system, so University of Amsterdam’s Michael X. Cohen and team investigated the brain’s dopamine-based reward system. He collaborated with Jennifer Young, Jong-Min Baek, Christopher Kessler, and Charan Ranganath of University of California, Davis to demonstrate the connection among trait extraversion, the A1 allele on the dopamine D2 receptor gene, and “extraverted” activity in the brain’s reward system during a gambling task. Participants received rewards either immediately following a behavioral response or after a 7.5 second “anticipation” interval. The research team monitored differing fMRI brain activity in the amygdala, which processes emotional stimuli and triggers excitement, and in the nucleus accumbens, which pushes people to seek rewards, novelty and risks. Brain activation patterns were related to individual differences in extraversion and presence of the A1 allele on the dopamine D2 receptor gene. Neural pathways differed for extraverts and introverts, validating anecdotal observations that these personality styles are distinctly different, even deep inside the brain and genes. Many introverts adopt extraverted behaviors in work and social situations, and a remaining question is how fMRI patterns differ for introverts displaying uncharacteristic extraverted behaviors in contrast to people with trait extraversion. 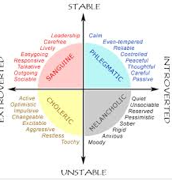 -*How easily can you adopt your non-dominant personality style when you need to display introversion or extraversion behaviors? -*What tactics enable you to adopt your less-preferred personality style? How Accurate are Personality Judgments Based on Physical Appearance? This entry was posted in Behavior Change, Business Communication, Career Development, Neuroscience and tagged A1 allele, amygdala, Benjamin Thyreau, Big Five personality traits, Carl Jung, Charan Ranganath, Christopher Kessler, Colin DeYoung, dopamine, dopamine D2 receptor gene, Extraversion and introversion, fMRI, Hans Eysenck, Hiroshi Fukuda, Jacob Hirsh, Jennifer Young, Jeremy Gray, Jong-Min Baek, Kai Wu, Kazunori Sato, Matthew Shane, MBTI, medial orbitofrontal cortex, Michael X. Cohen, Myers-Briggs Type Indicator, Nallakkandi Rajeevan, NEO Personality Inventory, NEO-PI-R, nucleus accumbens, orbitofrontal cortex, Paul Costa, psychological type, Robert McRae, Ryoi Goto, Ryuta Kawashima, Shigeo Kinomura, Susan Cain, Xenophon Papademetris, Yasuyuki Taki on December 8, 2013 by kathrynwelds.